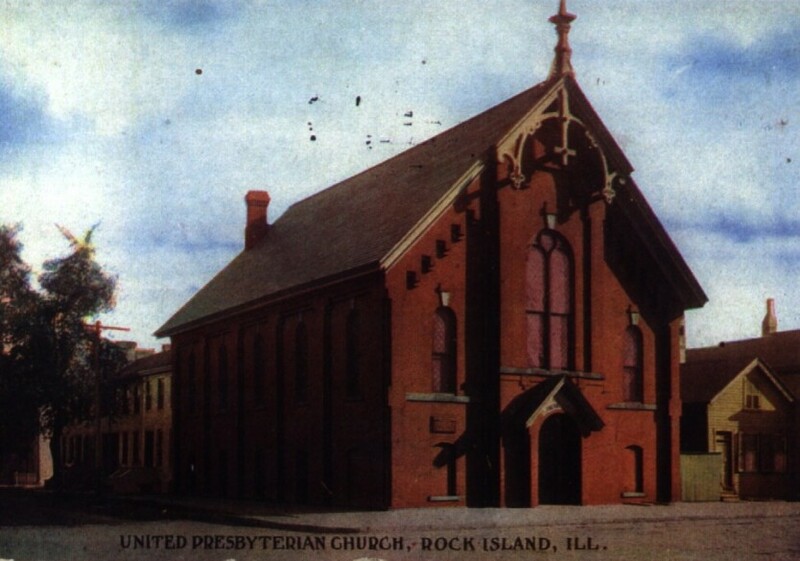 This is one of a series of postcards depicting local churches that was published by the Rock Island Postcard Company early in the twentieth century. It shows what may be Rock Island’s oldest remaining church building, certainly the oldest recognizable one. It was built in 1873 on the southwest corner of 14th Street and 3rd Avenue. At that time, there were three Presbyterian churches within walking distance of the courthouse as well as others located elsewhere in the city. Each congregation met a special need – some were ethnic (there was a German Presbyterian church), others reflected social disagreements (some congregations had divided because of opposing views on slavery). It is reported that Suzanne Denkmann Hauberg attended Sunday school in this building. The early congregation was apparently quite conservative, as Mrs. Hauberg said, “They sank Psalms, not hymns, and they were opposed to musical instruments in their church service.” When more liberal members installed an organ, she reported that at least one member left. United Presbyterians later moved to a new church on the corner of 18th Avenue and 24th Street where they remain today. They sold their old building to the Wayman AME congregation in 1947. Wayman AME Church occupied this historic building until after 2000. Brick detailing frames the window areas and eaves, creating strong shadow lines that provide visual delight. These shadows are very pronounced on the postcard photograph. The simple round arched windows are typical of the Italianate style, and are similar to those used on homes during this time. Notice the keystones above the windows– these are not just decorative, they are structural, acting as a wedge to keep the arch from collapsing. The front window is a bit fancier than the others, with wooden tracery creating a pattern of smaller arches within the larger arch. Notice, too, the beautiful wooden ornament in the gable, as well as the rooftop finial. Unfortunately, this fragile feature has succumbed to time. However even today there remains wood trim carved in a rope pattern around the entrance, while the date of 1873 is still visible above the door. Rock Island had several brickyards in the mid 1800s, and most brick was made locally. As a result, many of Rock Island’s oldest buildings are constructed of solid brick. Years later, many were painted. While the paint may have been an aesthetic choice, frequently paint was necessary, for reasons which lie in the nature of brick itself as well in as the way bricks are mortared together to create walls. A brick, especially a very old one, is much like a loaf of good European bread: It has a hard crust on the outside and is soft on the inside. The hardness of the crust and the softness of the interior is the result of the manufacture and firing (or baking, just like the bread) of the brick. Brick that was fired at a high temperature for a long time would be much harder. Brick is durable as long as the outer crust is intact. But damage to this crust can result from weathering – rain and wind blown erosion – or from chipping of the surface during the freeze-thaw cycle when water penetrates the mortar joints. Once the crust is disturbed, additional erosion can be very rapid. Thus once some deterioration of the surface occurred, owners usually painted in an attempt to recreate the outer crust and hence protect the wall. Unfortunately, sometimes the wrong kind of paint actually accelerated deterioration, because it sealed the brick too effectively and didn’t allow moisture vapor to pass through. Modern sealers, which can be substituted for paint, are transparent and breathable, but they must be reapplied every two or three years. The lesson in all this? Don’t disturb the surface of old brick – especially by sandblasting or other abrasive cleaning methods. And ….. if the surface has been damaged or eroded, protect it with paint or a sealer that is suitable for vintage brick. United Presbyterian/Wayman AME Church is a very simple, sturdy yet highly detailed structure. Although built without ostentation it was and remains a beautiful, even elegant, building. And since it is still a church, it is appropriate to recall the words attributed to architect Mies van der Rohe, who was world renowned for his modern stripped-down International Style. In architecture, according to Mies, “God is in the details.” God was definitely in the details of this church when it was built. This article, by Diane Oestreich, is slightly modified from the original which appeared in the Rock Island Argus and Moline Dispatch on June 17, 2001.